The April 8 reenactment at Fort Stotsenburg is drawing near. I know many of us are busy with real life but i'd like you to take note of this basic list to outline our uniform requirements for the reenactment. This time, we will have actual Philippine Scouts as our audience so let's try to make our impressions as authentic as possible. officers have shoulder straps built in. M 1917 "kelly" or "doughboy" helmet...fiberglass or steel. there was an order to daub the helmets in mud when the campaign began so if you can, please do so...specially those who have the old glossy fiberglass helmets. Garisson cap if you have it. US infantry leggings (optional but if you have 'em, wear 'em). Veterans have told us this was the first thing they threw away. M 1910 canteen pouch and canteen...if possible with the aluminum cap. Preferred outfit: Blue Dungarees, top and bottom OR overalls OR PA type khai shorts and shirt. PLEASE NOTE these have a particular design. only wear this combo if authentic. Gear should be identical to PS except for the gaiters. If you have an enfield bayonet and frog you may bring it. Weapons: P17 Enfield rifle, springfield if enfield not available M 1928 thompson with horizontal grip if possible. PS and PA should have proper haircuts. No hair past the ears or overlapping the collar. 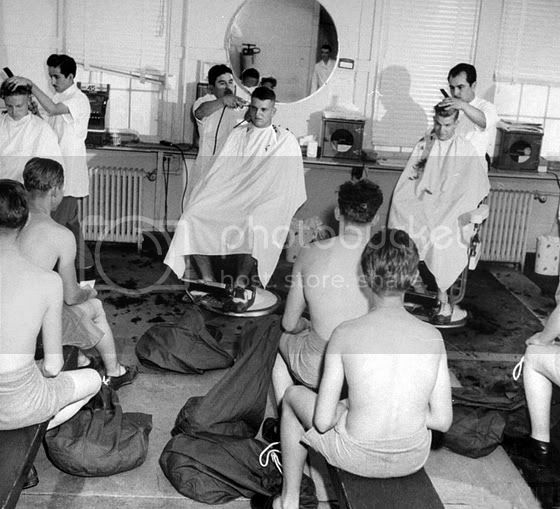 Photos from the campaign show that men shaved and kept their hair neat til the end. Items under debate: Carlisle type first aid pouches, short M1 bayonets, infantrymen wearing X type suspenders, plastic canteen caps, M1A1 thompsons...or we can drop it and make the excess tommy gunners medics and assistant gunners. cavalry gear??!!! that's it for now. i will continue to refine and update this list as info comes in. those with objections, questions, gear needed to rent. Please post here!!!!!! I wil post this same list in the ww2 airsoft page. you can post there as well. 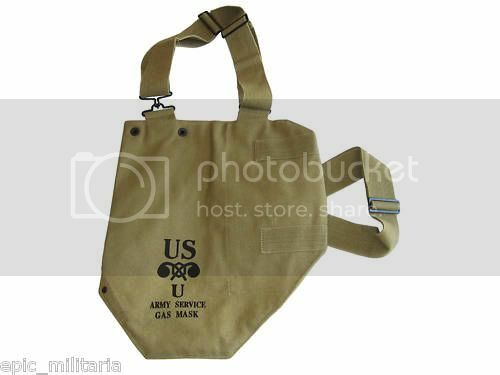 The Gas mask bags were worn at the beginining of the war. Thanks Albert. I'd like to add some trivia and suggestions for what they're worth. We usually wear the carabao or the seahorse patches as part of our "combat" impressions. Technically, we haven't seen any historical photos that the patches were worn in the field, just on jackets in garrison. However because part of what we do is "torch-bearing" for the heritage, we wear them anyway for public recognition. But the more accurate impression would not have a patch on the shoulder. If wearing the patches, try to match the seahorse patch with a cavalry outfit. The 26th cavalry was not technically a unit of the Philippine Division, which was an infantry division. Only the Phil. Div. wore the carabao patch. All other PS units by default were under the Phil. Department and would have worn the seahorse patch. For shoes/boots, if one doesn't have toe-capped leather shoes or boots, try as much as possible to wear brown shoes, not black. Thanks Vic!...gathering brown boots for the guests this early on so as not to have problems later on. We will probably have a "costume committee" meeting some time next week to thresh out details and acceptability, as well as uniform loaner procedures. One other little tip... every little bit helps. Try to avoid holding the WW2 rifles like they're modern M4's with pistol grips. You know point down and ready. That's more like a modern day stance. The WW2 era way was more of a port arms carry. yup! got it Vic. The japs even got the low trail arm carry right. we had one instance of a 45 being held in weaver stance during the last battle...caught on video...hehe. Gentle reminder to all representing and attending as PS period 1940! Get your haircut if you want to look and represent the Philippine Scouts. Please refrain form wearing modern eyewear, watches, earings non-1940's accessories. THE elite and most discipline unit of the US Army, THE best trained (highest percentage of marksmanship ratings of a Infantry Division) of America's first ground war of WWII.